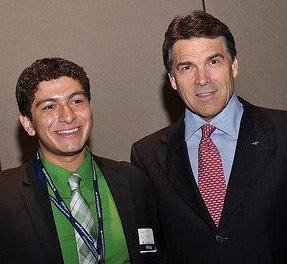 I am so excited to share with all of you that Fernando Trevino Jr. has been recently appointed by Governor Rick Perry to serve as Student Regent of Texas A&M. This is a very important appointment in a young person’s life since Gov. Perry appointed only 11 Student Regents across the State of Texas. Fernando Trevino Jr. is currently pursuing a bachelor's degree in political science from Texas A&M University and a master's degree in public service and administration from the Texas A&M University George H.W. Bush School of Government and Public Service. It was on July 14, 2009 that Fernando Trevino had contacted me for the first time via e-mail introducing himself to me, asking me to look at his blog writefortheright.com and shared his interest in conservatism and in my work with VOCES Action. He had recently graduated from High School and was about to enter as a freshman at Texas A&M University. That morning after I read the email from this young man, Silvio Canto informed me that we had a cancellation on the radio show that day due to a scheduling conflict and that I needed to find another guest for the radio show that day. I read the Write for the Right blog and I thought, “I have to invite these young people to be in the show", which I did. After having called him several times and leaving him a message, we had Fernando Trevino and Danielle Chavez on the show for the first part of the show. You can hear that radio show from July 14, 2009 here. Since this time, I have enjoyed a good relationship with Fernando, not only speaking with him many times but also having him as a guest in my home. Fernando is intelligent, an articulate speaker, educated, kind, a leader and most of all teachable. Fernando has been writing not only for Write for the Right but also for TexasGOPVote and for Empower Texas. He has also been speaking at public forums in many places, and has been encouraging other young people to get involved in the political process, etc. I recently interviewed Fernando, shortly after being notified that he had been appointed to serve as Student Regent for the Texas A&M University System’s Board of Regents. Why are you studying at A&M? Texas A&M has always been special to my family. My mom and my uncle were the first in our family to attend college and did so here at Texas A&M. You can say I was “brainwashed” to be an Aggie from an early age, but once I decided to visit A&M and see all that was available to me here I fell in love with it. Many of the traditions here are still very much alive and in practice, which is such a beautiful part of this university and adds to the strength of the Aggie family. What do you desire to do as a Student Regent? As a Student Regent, I hope to work with the Board of Regents to make sure that more students have the opportunity to achieve a quality education. I look forward to meeting with students from all 11 universities in the Texas A&M University System and representing them and their concerns before the Board of Regents. Representing approximately 120,000 students across 11 universities and a Health Science Center in addition to 7 state agencies will require a lot of time, but I am dedicated to serving my fellow Aggies to the best of my ability. I am currently in my second year at Texas A&M University working on my Bachelor of Arts in Political Science and was recently accepted to the George HW Bush School of Government and Public Service. Through the Bush School, I will be working on my Masters of Public Service and Administration while completing my undergraduate degree through a 5 year program which I will complete in a total of 4 years at Texas A&M. Public service is essential to building stronger communities and brighter futures. Through Texas A&M I hope to harness my passion for service in order to give back to my community and my state. After Texas A&M, I intend to attend law school and practice in Texas. How long have you been involved in community issues? I have been involved in community issues since high school. I always had a passion for public service but it was not fully realized until high school and has persisted since then. What is special about Texas? Texas is a state where anything is possible. People are allowed to more freely pursue their own futures and destinies than in other states. Much of this is possible due to the quality of the institutions of higher learning that we are so blessed with here in Texas. Congratulations to Fernando Trevino Jr. We are so proud of you!